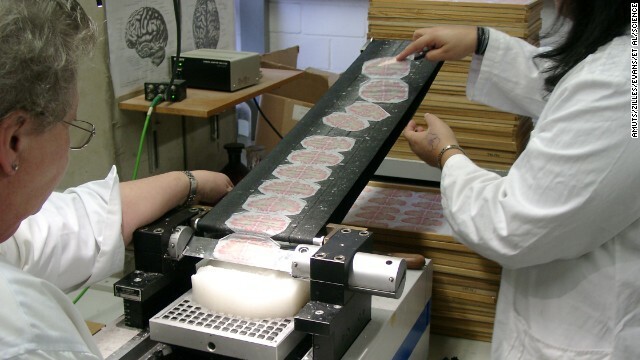 Researchers cut thin slices of a brain using a tool called a microtome. A group of international researchers announced Thursday that they have created a three-dimensional model of the human brain in unprecedented resolution. It's called BigBrain. "BigBrain is the first ever brain model in 3-D, which really presents a realistic human brain with all the cells and all the structures of a human brain," said Karl Zilles, senior professor of the Julich Aachen Research Alliance, in a press briefing. The research is being published in the journal Science. This model is akin to a scaffold into which information about the living brain can be inserted. It's a reference to provide framework for research in many directions, such as how the brain is organized. Having this model allows researchers to study the brain in finer detail than ever before. Previously, atlases of the human brain have had a resolution of about 1 millimeter, based on magnetic resonance imaging. This one, however, goes 50 times deeper, with a resolution of .02 millimeters in all directions. This is thinner than a human hair, said lead study author Katrin Amunts, director of the Cecile and Oskar Vogt Institute for Brain Research at the Heinrich Heine University in Dusseldorf, Germany. BigBrain will be made freely available to the public. Researchers who study neuroscience can use BigBrain to simulate how a brain develops normally or how it degenerates in conditions such as Alzheimer's disease, said Alan Evans of the Montreal Neurological Institute at McGill University and senior author on the paper. It makes it possible to model how the brain would perform without certain key connections or structures, investigating the process of age-related impairment. "We can understand more about how the brain works if we can model it inside a powerful computing system," Evans said. An Alzheimer's researcher could also use BigBrain to look into the details of the hippocampus, a seahorse-shaped structure in the brain crucial for memory, Zilles said. Creating such a model of the human brain is substantially more difficult than creating a similar model for a mouse. The human cerebral cortex volume is about 7,500 times larger than that of a mouse cortex. The human brain has 53,000 times more white matter than that of a mouse. The researchers assembled this model based on the brain of a single person: A 65-year-old woman. They cut her brain into more than 7,000 sections at a thickness of .02 millimeters, and stained each of these pieces to detect cell bodies. Then each section was digitized. The BigBrain will eventually be able to integrate molecular data into the model, something the researchers are presently working on. "Only if we understand the level of molecular distribution patterns and expression patterns in the brain, and connect it with the detailed anatomy, then we can really understand the relationship between structure and function in the human brain," Zilles said. The size of the data is mind boggling: It's on the order of a terabyte, which is about 100,000 times larger than a typical MRI, Evans said. The researchers have also been in touch with the Allen Institute for Brain Science, which has its own brain atlas data portal, about integrating the Allen data with BigBrain. It's important for the field of neuroscience to have one brain model that serves as the common basis for scientific discussions, Zilles said. Ultimately, researchers would like to have a model with a resolution of one micrometer, such that details at the single-cell level would be revealed. The research is part of the Human Brain Project, a 1-billion euro European program to recreate the human brain inside a supercomputer. Next project: Figure out how it works? This is an excellent move toward better understanding of the brain. However, I should caution them on one point. You only have one brain. You need a bigger data set to work with. It wouldn't hurt to get some male brains, autistic brains, brains damaged by strokes, physical trauma, et cetera. Without a bigger pool of brains you can't have any absolute certainty that discovered mechanisms work the same way in any brain except for the one currently on file. Need enough variants to compare between in order to unlock the secrets of how the systems interconnect and function. Unbelievable…… My friend Lynn has just married to a handsome black man. They met through ~~MixëdŚingle.Çoм ~~Here is the best, largest and most successful Interracial online dating site for black and white singles share your life and love with friends online. it is a nice dạting service for Interracial singles to find their romantic soul mate.. You can meet (lawyers,busy professionals, CEO,benefactors. models, celebrities, etc….). If you are single ,have a try.